Damn Nature U Majestic of the Day: Henry Jun Wah Lee journeys through the expansive wilderness of America’s southwest — from Monument Valley and the Grand Canyon to Yosemite National Park and the eastern Sierras — and returns with an SFX-less, CGI-less testament to the beauty of a nature untouched. Afternoon Snack: SKIFCHA is a cat. With glasses. And a moustache. Who listens to dubstep. How have you not pressed play yet? Upgraded Childhood of the Day: Big kid Devin Graham continues his ongoing series of childhood upgrades (previously, and, also) with the installation of the world’s largest rope swing. Shot in Moab, Utah on a number of fancy cameras. Instructional Video of the Day: You are going to learn how to flirt like a crazy person. Playing Doctor of the Day: Roan’s sister Ruby performs a tooth extraction on her little bro with a bit of string and her mini motorcycle. OMG! Adorbz of the Day: Feeling extremely unmotivated and unhappy of yourself? Looks like you need a loud dose of thumbs up for rock ‘n’ roll courtesy of the most inspirational kid ever. Well, it’s been a long afternoon and I think I’m just gonna relax here on the floor with my toys if you don’t mind, Mom. All work and no play, am I right? It’s just— AHAHAHAHAHAHAHAHAH. MOM-MOM, LOOK FAST! PUT DOWN THE CAMERA! THE DOG JUST– I’m sorry. I’m sorry. 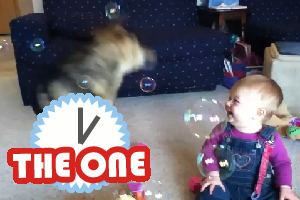 The dog just bit those bubbles and AHAHAHAHAHAHAH HE’S DOING IT AGAIN YOU GOTTA WATCH THIS! We get it — you’re busy. Only have time for one web bit a day? Here’s The One thing we think you cannot miss today. Subscribe to ‘The One’ RSS Feed. He’s Zack! Stand Back! This Is His Awesome Bar Mitzvah Video! So, what’s this tween propaganda piece all about? Well, the basic idea is that he’s Zack, and you should stand back because he’s unique and fabulous. ‘I’m Zack’ covers his love of gardening, cooking, gemology, the musical ‘Hairspray’ and adequately-heated swimming pools. Plenty of actual grown-ups don’t have the chutzpah to make a music video about themselves, so it’ll be interesting to see whether Zack still feels unique and tres chic ten years from now. But today, what the heck, let him have his moment, internet. The haters all just wish that they could be Zachary anyway. I do feel sorry for the girl cousins in the background, though. They’re clearly struggling to appear bored in the face of Zack’s overwhelming fabulosity.